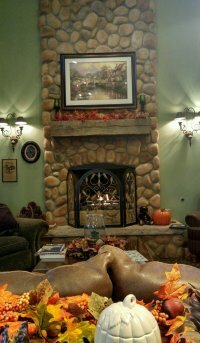 Kick back in our plush fireplace lounge sitting area, surrounded by historic decor which includes our tribute to Abraham Lincoln and our 19th-century local history. Play a game of Civil War chess, read a book, or just surf on your computer/tablet/digital device using our free Wi-Fi. Your relaxing stay at Hearthstone Inn & Suites will include our Deluxe Continental Breakfast beneath beautiful Tiffany-style lighting. Soft early-American instrumental music, Thomas Kinkade art, and extraordinary hand-painted, dimensional Greene County murals will captivate you. No "national-brand" hotel can even come close! Stately, magnificent hand-hewn barn beams, prepared in 1885, surround our breakfast commons beneath the second-floor balcony. Brilliant color cascades through these 19th century reproduction lamps, accentuating every stroke of the workman's ax upon the oak timbers above you. A fitting tribute to the carpenter/barn builder Thomas Wharton who was born in 1853 right here in Greene County and whose "artist's signature" was hand-applied to the upper beam at the completion of his work for all to see! Our hand-painted mural artistry captures the essence of Greene County Ohio and our beautiful Cedarville countryside. Find the steam locomotive, the nearby "McFarland" cabin from 1825, and our local Civil War cemetery monument. You'll be amazed at the life-like, 3-dimensional detail of every leaf and blossom which magnificently accents this truly elegant, whimsical, and historic breakfast area. What's for Breakfast? 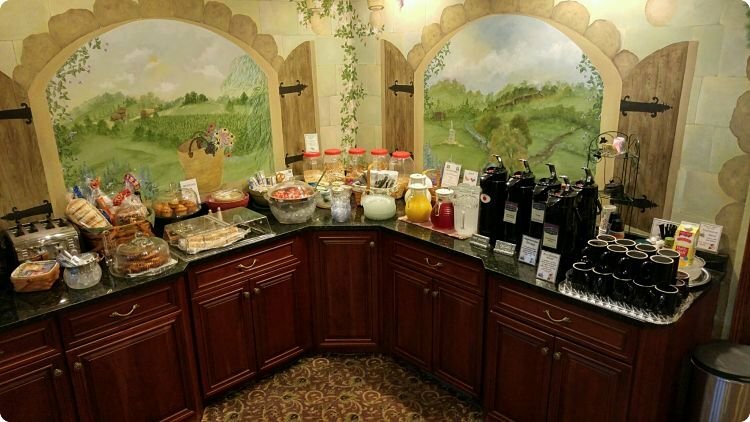 Our self-serve Deluxe Continental Breakfast typically features an assortment of scrumptious items such as tasty cinnamon rolls, pastries, heat-n-eat Bob Evans' sausage biscuits and sausage/egg burritos, hard-boiled eggs (not processed egg product), full-sized low-fat yogurts, premium tropical fruit salad, assorted muffins, assorted bagels, cereals (including gluten-free options), fruit juices, locally-roasted and custom-blended gourmet coffee, Bigelow herbal and fancy teas, fruit juices... and an occasional weekend surprise such as caramel sticky bun coffee cake, cinnamon/pecan coffee cake, or seasonal baked items. Since we are a smaller independent hotel, there is no "cooking kitchen" in which to prepare hot buffet-type items (which produce much wasted food as with some larger lodging properties). Gluten- Free dietary needs? As above, we have several Gluten-Free cereals available. Lactose-Free milk substitutes are also available upon request. Welcome to the Hearthstone Cottage Gift Shop. Our one-of-a-kind shop is crafted of 1880's barn wood from floor planks to ceiling beams. While lantern light cascades through the 1840s window glass, you'll enjoy the beautiful detail in the hand-painted ivy which surrounds the hand-crafted shop window. With an exterior designed to reflect the warmth of an English countryside painting, our most unique shop offers many items which are made by area craftspeople. Pottery, hand-crafted Hearthstone Inn coffee mugs, American Civil war chess sets, soaps, herbal items, slate paintings, cookbooks, dried arrangements, candles, accent jewelry, lotions, and early-American music CDs are just some of the delightful items available. We're sure that you'll enjoy browsing to the Hearthstone Cottage Gift Shop! Our gift selection is always changing! Thinking of gift-giving for a holiday or special event? 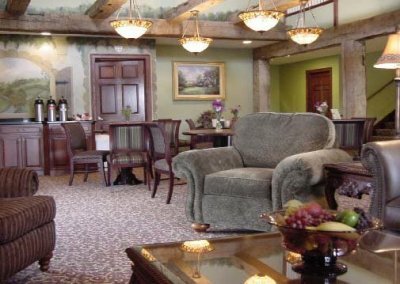 Giving the gift of a memorable stay at Hearthstone Inn & Suites is as easy as calling us at (937) 766-3000! All Gift Certificates can be personalized with a greeting/message of your choosing! Your customized Gift Certificate Package can include informational brochures about our area attractions such as bike trails, antiquing, the Village Yellow Springs, aviation heritage sites in Dayton, etc. Your certificate can be purchased as a night(s) stay for a specific room type (i.e King/Double Queen or Deluxe Jacuzzi Suite) or for a value such as $100.00, $150.00, etc. (Most popular are requests for specific room type certificates, especially "One Night's Stay - Deluxe Jacuzzi King Suite"). 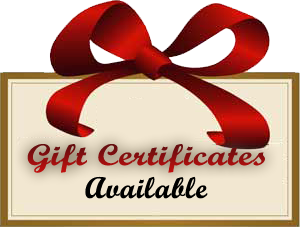 Gift Certificate Packages are sent via Priority Class U.S. Mail, but if time is running short for your gifting day, we are also able to send you a PDF copy of your Gift Certificate Package via email with your actual package to follow via Priority U.S. Mail.